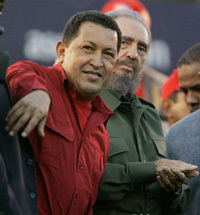 Venezuela’s Hugo Chávez with Cuba’s Fidel Castro in July 21, 2006 at an event in Argentina. (by the Editors of the Miami Herald) – Hugo Chávez’s folksy charm and forceful personality made him an extraordinary politician. His enviable ability to win a mass following allowed him to build a powerful political machine that kept him in office from February of 1999 until his death on Tuesday. But as a national leader, he was an abject failure who plunged Venezuela into a political and economic abyss. Shortly after coming to office, he rewrote the constitution to his liking and aggressively set out to rig elections and stifle adversaries in the legislative branch and the courts. Unable to brook [stand; put up with] criticism, he turned his fire on the independent news media, eventually silencing most voices of opposition by bully tactics and economic intimidation. His Bolivarian regime rewarded supporters and punished opponents, giving rise to enormous corruption and the creation of a new class of greedy oligarchs [a small group that runs everything] with political connections. Unfortunately for Venezuela and for all his political skills, the president was both an incompetent executive and a worse economist. For Venezuelans, the worst aspect of the Chávez years was the soaring crime rate. Venezuela has become one of the most violent countries in the world, with nearly 20,000 murders recorded in 2011 and a homicide rate that some experts say is four times greater than in the last year before Mr. Chávez took power. On the international front, Mr. Chávez eagerly accepted Fidel Castro as his mentor, providing Cuba with cut-rate oil and making common cause with Iran and other rogue regimes. His departure leaves the anti-American front leaderless on a hemispheric level and could eventually threaten the subsidy that Cuba relies on to keep its economy barely functioning. As a result of all this, Venezuela today is a polarized society divided between the intolerant supporters of Mr. Chávez’s Bolivarian Revolution and a democratic opposition that, against all odds, has waged a courageous fight for a democratic alternative. The president’s death means a new election must be called soon. Under Hugo Chávez, the electoral machinery was stacked against the opposition and that will doubtless be the case again, but the United States and democracies throughout the hemisphere should insist on a fair and transparent electoral process to select the new president. The Organization of American States, which was once seen as a defender of political and civil liberties in the hemisphere but has made itself largely irrelevant in recent years, could regain some of its stature by taking a prominent role in ensuring that the people of Venezuela can make the most of this opportunity to restore their democracy. None of Mr. Chávez’s would-be successors, including Nicolás Maduro, his vice president and designated political heir, possesses the fallen leader’s forceful personality or political skill, though his popularity may extend beyond death to give the regime’s official candidate an edge in the next election. But without discarding “Bolivarian” principles and restoring the country’s democratic institutions, no one will be able to stop the downward spiral of Venezuela that began the day Hugo Chávez was elected president. Published at miamiherald.com on March 6, 2013. Reprinted here March 7, 2013 for educational purposes only. May not be reproduced on other websites without permission from The Miami Herald. 2. The purpose of an editorial/commentary is to explain, persuade, warn, criticize, entertain, praise, exhort or answer. What do you think the editors’ purpose is for their commentary? Explain your answer.